Tyron Woodley returned from an 18-month layoff to capture the Welterweight Championship as he stopped Robbie Lawler in the first round of their title fight in Atlanta. The appropriately named "Chosen One" realised his dream by becoming just the second man to knock out Lawler, feinting before landaing a blistering right hand on the button and follow-up strikes for the quickest finish in Welterweight title fight history. 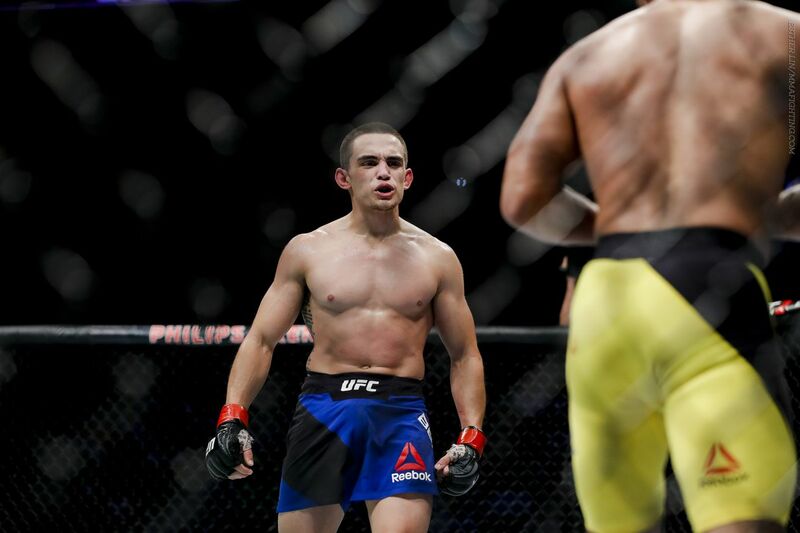 In addition to the seventh UFC title change of the calendar year, UFC 201 set up a potential all-Polish clash for the Strawweight belt, along with a huge career saver for Jake Ellenberger who stopped Matt Brown. Kick starting the main card festivities were the duo of Ryan Benoit and Fredy Serrano, taking the opening spot of the pay-per-view on short notice because of late changes elsewhere. Despite coming in on 10 days notice, Benoit was unafraid to get into the pocket, while the Olympic-calibre Colombian would end up becoming progressively desparate for the takedown, after his striking let him down. Every big shot was telegraphed - the only one which probably did connect was well after the first frame was over with, when Benoit struck his opponent after the bell. Serrano continued to scoop for the takedown but couldn't do too much with it, in what ended up as a scrappy victory for the American. Erik Perez edged Francisco Rivera in a gutsy Bantamweight clash packed with plenty of wild exchanges that have become a trademark of the latter. "Cisco" continued to swing for the fences although his counterpart wasn't exactly backing down, prepared to trade with him making for some highlight reel worthy action. Midway through the fight and Rivera would be sporting some battle wounds, a cut on the head as a consequence of an elbow. That wouldn't deter him from trying to take the 26-year-old's head off though, beginning the third round by more wild swings before tumbling to the canvas as Perez moved out of the way. When it got back to the mat, Perez was able to score by controlling and landing some damage - giving him two rounds to one as he got the nod by unanimous decision. Jake Ellenberger produced one of the biggest wins of his career when he tore through Matt Brown in south of two minutes. With his future inside the Octagon hanging in the balance after stuttering form, he felled "The Immortal" from the very first exchange thanks to a thumping straight right. His opponent covered up, and then tried to push the pace, but soon crumbled at the hands of an excruciating body kick which hit the target, once again sending Brown down - and this time he wouldn't recover. Ellenberger swarmed with follow-up strikes at that was enough for the referee, snapping the losing streak and becoming the first man to knock out Brown in the process. Karolina Kowalkiewicz edged Rose Namajunas in a pivotal Strawweight matchup to set up a potential all-Polish clash with compatriot and champion Joanna Jędrzejczyk. The Pole opened the contest by striking at range, attempting to avoid takedowns with her opponent clearly more comfortable when the action took to the canvas. While she did definitely get her attention with some knees in the clinch, a late takedown made for some tough scoring just five minutes in. The striking of the European would go from strength to strength in the second round, with handfuls of knees and elbows as part of some enthralling exchanges. Namajunas looked for takedowns late in the fight but was once again unable - and Kowalkiewicz strolled to the end, although the judges scorecards suggested a little less: giving her the win by split decision. It was then time for the main event, which ended in the very first round at the hands of Tyron Woodley's lightning fast pace as he dethroned Robbie Lawler. The champion was far more cautious to begin the round, circling on the outside well aware of the traits from his opponent. His speed was on full display early on, swinging for the fences and initiating the clinch - but the referee would give him little time to get the takedown, breaking it up. As he continued to control the centre and pushed the pressure, he landed a rapid right hand over the top which dropped his compatriot, following up with some strikes as the fight was brought to a halt. With that, Tyron Woodley had pulled off yet another upset, realising his dream as he captured the Welterweight strap, while the reign of Lawler came crashing to an end. Ending arguably the biggest month in the history of mixed martial arts, Woodley stood atop the 170 lbs pile. When many believed Lawler verged on invincibility, he came and rewrote the rules like many have done in the year. We have a new champion once again.